Warm alpine scented air greeted us as we exited my Subaru on the Cruikshank Main in the Comox Lake Region. The morning of June 7th, we set out early in the morning to avoid the heat of the day; the forecast was for an unseasonable 30+ degrees Celsius. 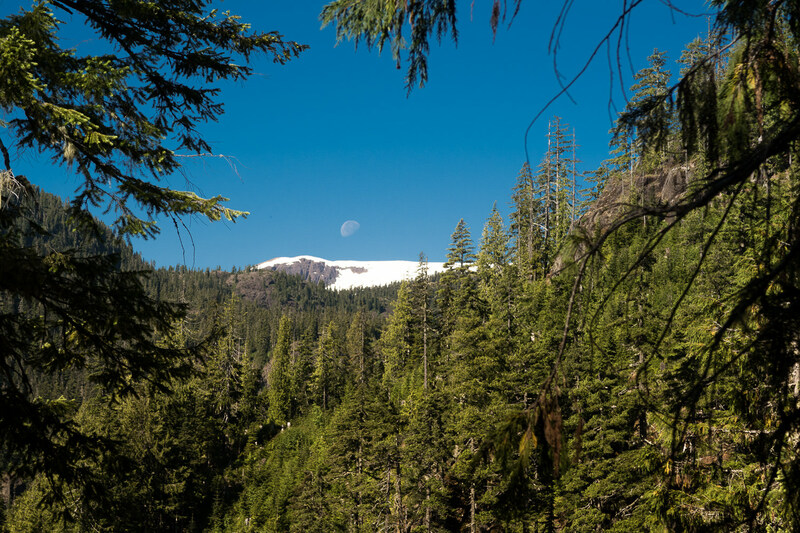 Mount Ginger Goodwin is commonly accessed via the Capes Lake Trail. The trail is maintained by the CDMC (or more likely Ken Rodonets) and is in very good condition. It travels through several types of terrain all of it uphill! The route is primary hiking on trail much of it on steep grade. Of note, however, there are a few airy sections and in the higher regions there is a short scramble (some would argue it too is a hike) and a few hundred meters of bushwhacking through B3 terrain. We parked at 230 metres and the summit is at 1164 m. I have hiked a lot this year, this is the longest stretch of uphill without a break I’ve done in a long time! The route immediately heads up over old logging and up and up and uuuuuuuuuuup, eventually into second growth and old growth. As well groomed as the Capes Lake Trail is, it leads past the undeveloped route to Ginger Goodwin’s summit, we nearly the markers in the trees. The best instructions I can provide, beyond the GPS route, once you start taking your first steps downhill watching on the right (north) side of the trail for flagging and orange markers in the trees. The markers give you a general direction to walk but there isn’t a booted path. 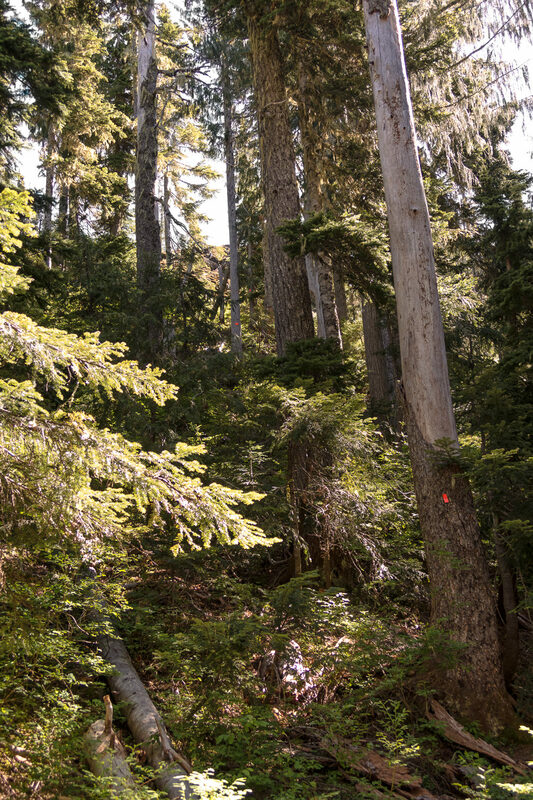 From the Capes Lake trail walk in a northerly direction, crossing many natural obstacles like low lying branches and fallen rotting logs. Eventually the route takes a 90 degree turn to the west and heads up toward the summit. The route gets very bushy and crosses up a short rocky ledge or two. It was dry and we didn’t need to use our hands but in wet conditions it could be very slippery. We reached the summit at 1165 metres, before noon. 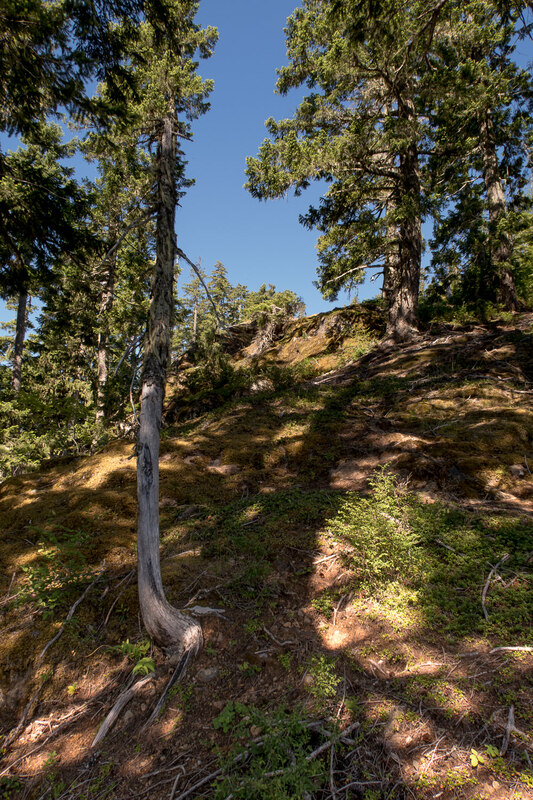 It’s broad and filled with several copes of trees that require some navigating around to find the summit cairn. We rested a long while and explored the broad summit, taking photographs of the surrounding mountain ranges. 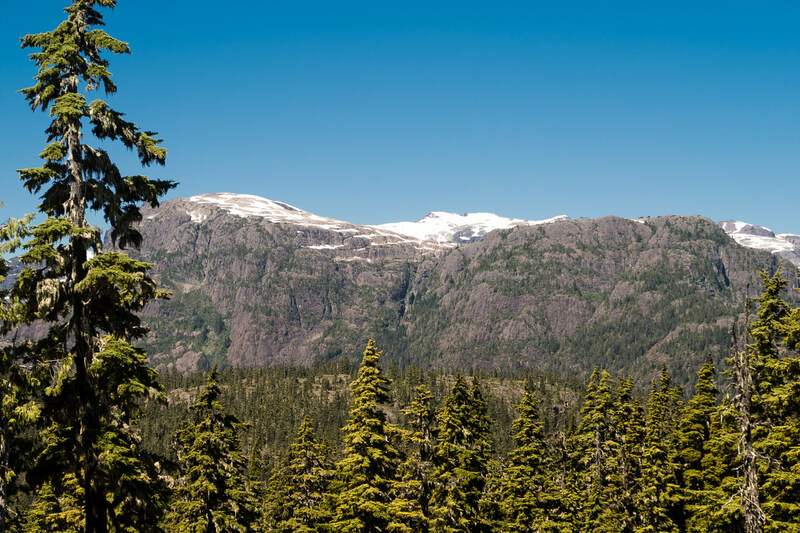 There was a particularly fabulous view of Mount Celeste and Rees Ridge, it makes me want to revisit the distant ridge. Our return to the car was fast and hot. 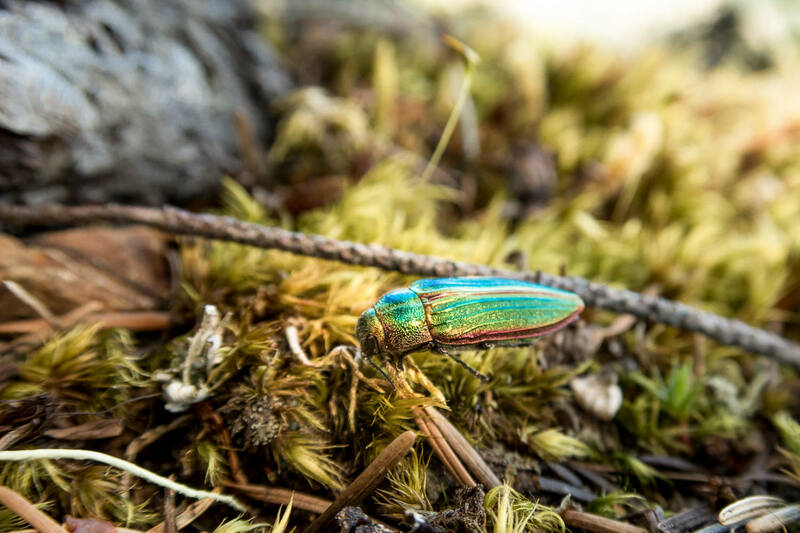 We could hear the call of the Golden Buprestid, a telltale sign of a dry hot day, and even caught sight of several. Even on the rapid descent we were over heating. I was extra grateful for the early attempt on the summit, we missed the hottest part of the day. 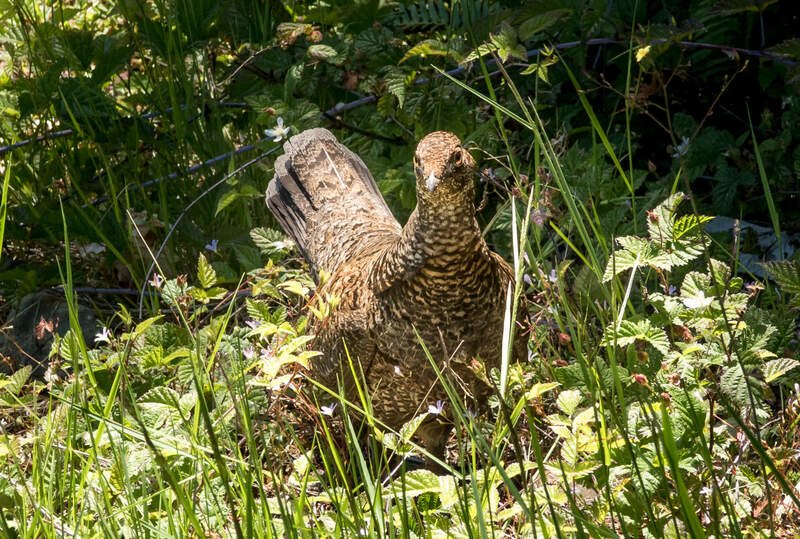 We nearly stepped on this grouse’s chicks! 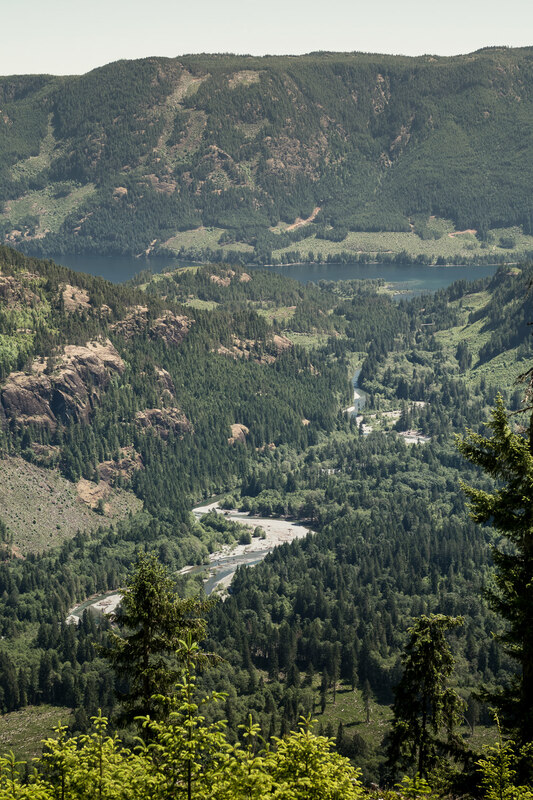 We stopped only once to take in the final view of the canyons below us. Phil and I discussed our concerns for the summer and pondered when the gates will be locked to a fire ban. The low alpine areas are already parched and most of the tarns that should be filled at this time of year , and some years even still have snow around them, are dried or drying up. Its going to be one thirsty summer in the alpine. As it turns out, only a week after the hike, the gates were locked for a fire ban. Life in the Comox Lake region is a lonely existence for those poor mountains and fabulous ridges. What are you finding the conditions in the alpine is? What are your concerns?